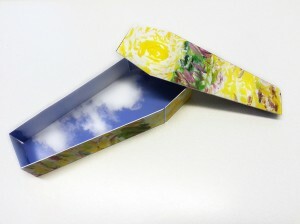 The project “Buried Inside an Artwork” creates alternative visuality within the delicate theme of death and mortality. More broadly, it asks and demonstrates how speculative design can introduce new visual approaches for tackling sensitive subjects. What would remain if, for example, the ceremonial imagery of death and funerary art were stripped of all customary symbols and elements? What would the emergent visuality look like? 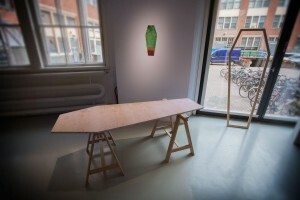 The prototype combines a work of art with a coffin. 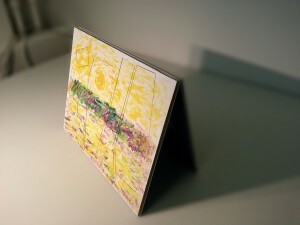 An artwork will be painted on a wooden frame, 2.2 x 1.5 metres in size, and this painting will then be mounted on a wall in someone’s home, for example. When the owner of the work dies, the parts that form the coffin will be removed from the frame and put together. The deceased person will then be buried in the coffin. The frame that is left behind is a work of art in itself, and it will also serve as a memory of the loved one who has passed away. 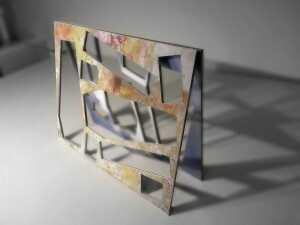 Buried Inside an Artwork presented a prototype of the product. 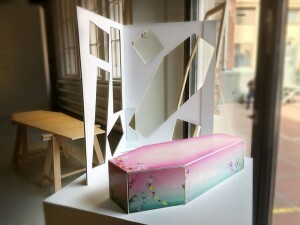 In addition to the prototype frame of the coffin-artwork, the exhibition featured sketches made by painter Katja Tukiainen and painter-illustrator Riikka Juvonen. 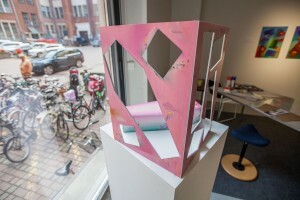 The artists have made the prototype in collaboration with the person who commissioned the coffin. I was available for discussion in the gallery for the duration of the exhibition, and the conversations between me and the audience members will become part of the finished work at the conclusion of the project. 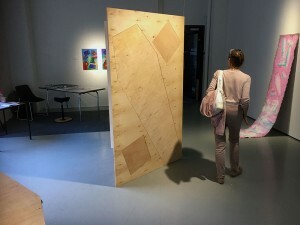 It was the first exhibition to focus on the art produced by postdoctoral researchers of the Academy of Fine Arts held at the Exhibition Laboratory in Helsinki. 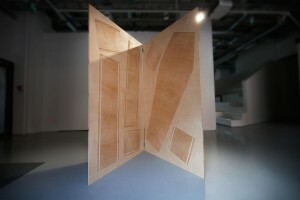 The exhibition presented a parallel view to three different ways of doing research. The most prominent differences between the three approaches concern research methodology, while the similarities become evident in the themes and the presentation of the projects. 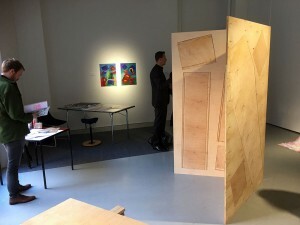 The works in the exhibition included Deutsches Lager – Inside and Beside the Camp, which was a project by Jan Kaila, Petri Kaverma’s Buried Inside an Artwork, and Jyrki Siukonen’s Description of a Bridge.